A strain of genetically modified wheat developed in the UK has failed to repel pests as intended in field trials. 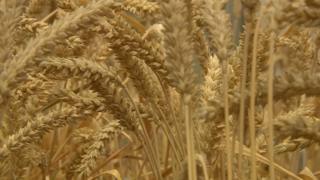 Scientists had wanted to engineer a variety with an odour that deterred aphids, nicknamed "whiffy wheat". While it worked in the lab, out in the field, the wheat was still attacked by the pests. But negative results are part-and-parcel of the scientific process; researchers behind the project will now work to improve the strain. The wheat trial was the subject of protests by anti-GM campaigners in 2012. And opposition groups said the outcome was further evidence of the "folly" of investing in GM technology. The research project itself cost £732,000; another £444,000 was spent on fencing to protect the trial site from intruders and to stop wild animals getting in. The result of the trial held by Rothamsted Research in 2012-2013 was published this week in the journal Scientific Reports. In the laboratory, the scientists were able for the first time to modify wheat so it produced a type of scent that aphids emit when they are threatened. It is a similar molecule to the one found in peppermint. Aphids - such as greenfly and blackfly - damage plants by sucking nutrients from their sap, and can also introduce plant viruses. In controlled conditions, the aphids were repelled and the predators were attracted. This success did not transfer to the field. They are not quite sure why, but one hypothesis is that the aphids became used to the chemical deterrent, and so weren't put off by it. Professor Huw Jones, senior molecular biologist at Rothamsted Research with oversight for the genetic changes in the plants said: "As scientists we are trained to treat our experimental data objectively and dispassionately but I was definitely disappointed. "We had hoped that this technique would offer a way to reduce the use of insecticides in pest control in arable farming. As so often happens, this experiment shows that the real world environment is much more complicated than the laboratory." However, the scientists point out that some failures are inevitable. Dr Toby Bruce, first author of the study and senior chemical ecologist at Rothamsted Research commented: "In science we never expect to get confirmation of every hypothesis. "Often it is the negative results and unexpected surprises that end up making big advances - penicillin was discovered by accident, for example. "If we knew the answers to every question before we started, there would be no need for science and there would be no innovation. "This trial has ended up yielding more questions than answers, but that means we have more work to do to understand the insect-plant interaction and to better mimic what happens in nature." Campaign group GM Freeze, the UK's umbrella campaign on GM food and farming, said that the outcome of the trials provides clear evidence of the "folly" of focusing public resources on the development and promotion of GM crops. Liz O'Neill, director of GM Freeze, said: "The waste of over £1m of public funding on a trial confirms the simple fact that when GM tries to outwit nature, nature adapts in response." Lincolnshire Farmer Peter Lundgren was a vocal opponent at the time of the trials. He responded by saying: "The truth is that nature is just too complex for the simplistic thinking behind GM. "Meanwhile, we are crying out for investment in proven solutions like integrated pest management, companion cropping, conventional plant breeding, and novel chemistry. "It's time to stop throwing good money after bad and put our publicly funded scientists to work on solutions that will give growers effective and financially viable options to control pests and the diseases they carry." But many scientists argue that the technology has the potential to help solve looming problems with the world's food supply, by - for example - increasing yields to make more efficient use of land, and lowering the quantities of pesticides used on crops. Prof Jonathan Jones, a molecular biologist at The Sainsbury Laboratory in Norwich, said: "These data provide a timely reminder that what works in the lab might not always work in the field, especially when the GM trait is intended to influence something as complex as insect behaviour. "Despite the strenuous efforts of anti-GM protestors, a field experiment was conducted, a clear result was obtained, and the scientists involved can now use this information to refine and improve their technical approaches to control aphids in crops without using insecticides." The Rothamsted Research study was funded by Biotechnology and Biological Sciences Research Council (BBSRC), which is in turn funded by the government. The author and campaigner Tony Juniper told the BBC: "I still believe the industry is finding it hard to prove a role for itself and that conversations going on around more integrated approaches to farming - that rely less on technological 'silver bullets' - have more potential than the pursuit of GM methods, that often miss the point as to what the actual problem is. "Then there are the issues about who controls the technology, via patents, contracts and royalty payments, and how the widespread uptake of GM farming could have profound impacts in terms of how power is distributed across the food system."